Who wants to buy me one of these?? Well, Mad Catz was kind enough to send their holiday suggestions for 2013. As can be expected, it's most of their recent product. This is not a bad thing though, as some like the M.O.J.O. 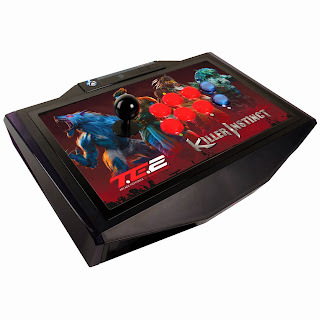 and Killer Instinct Tournament Edition Fightstick are pretty awesome! Read what you can buy us after the break! Welcome to the world of the M.O.J.O. Micro-Console powered by Android. A revolutionary new way to make your mobile games massive, M.O.J.O. takes Android powered mobile content and presents console quality mobile gaming in the comfort of your living room and at a fraction of the software price. Open and honest, M.O.J.O. is the most powerful Android games console the world has ever seen, powered by the NVIDIA Tegra 4 chip. Compatible with many game controller compatible games and aps available for download from Google Play or the digital store front of your choice, M.O.J.O. is just at home surfing the web, using email, or streaming your movie, music and DLNA content as it is playing games. Part of the GameSmart mobile eco-system, users can even plug in Bluetooth keyboards, mice and headsets and turn M.O.J.O. into a productivity powerhouse. No walled garden, no subscription fees, gamers are free to download compatible content from wherever they wish. Included with M.O.J.O. is the revolutionary C.T.R.L.R Mobile GamePad. Powered by next-generation Bluetooth 4.0 technology, the C.T.R.L.R features remarkably fast reaction times, a battery life of over 50 hours and unique ‘Mouse Mode’ functionality which allows full mouse cursor control on the big screen via the controller thumbsticks. Kick off the next generation of console gaming in style, with the jaw-dropping Xbox One Killer Instinct Arcade FightStick Tournament Edition 2. Mad Catz make the worlds’ best-selling range of Arcade FightSticks and are proud to bring their impressive legacy to the brand new Xbox One console. A true evolution of the company’s FightStick range, the TE2 is an entirely new design, evolving the FightStick for an entirely new generation of gamers. Once again, demanding only the best materials and components, the new TE2 FightStick uses premium, arcade-quality Sanwa Denshi parts which now feature optional backlit illumination for a stunning effect in a darkened environment. The side panels modelled on the arcade ‘Viewlix’ configuration are also backlit for effect. The all new control panel allows users to lock their menu buttons and set controller options and the removable connector cable prevents damage during transport. Speaking of transport, gamers can now add the optional shoulder strap allowing for easy transport during tournament play! Fully modable and customizable, the TE2 now features an easy hinge design, allowing instant access to the insides of the stick, allowing gamers to swap out artwork and components in an instant. The TE2 even features internal storage and comes complete with its own modifying tool! Own the competition with the Mad Catz S.T.R.I.K.E. 3 Gaming Keyboard! An ideal entry into the world of competitive gamin, the S.T.R.I.K.E. 3 offers a stunningly attractive yet remarkably powerful keyboard, ideal for competitive play. Whether your game of choice is an FPS, RPG, MMO, RTS, MOBA or any other genre, precise key response, customizable backlighting, and programmable macro keys all help give you an advantage over the competition. Featuring a uniquely designed keyboard membrane, the S.T.R.I.K.E. 3 offers the reliability and precision common to a mechanical keyboard but without the excessive noise and bottoming out of keys associated with a mechanical design. When used in conjunction with a member of Mad Catz' line-up of award-winning R.A.T. gaming mice, you'll have all the inputs you need to play at your very best! The TRITTON Kunai Stereo Headset delivers a comfortable, high-quality stereo experience for multiple gaming platforms and mobile devices. Designed to look striking and sound stunning, the Kunai outputs game and chat audio through a pair of precision-tuned, amplified 40mm speakers employing neodymium magnets. Providing the ability to adjust your chat volume and voice volume separately and on-the-fly, the Kunai is compatible with nearly any device, the Kunai universal works with Xbox 360, PlayStation 3, Wii U, PC/Mac, and Mobile devices! Gamers can even detach the mic and turn Kunai into the idea everyday set of headphones, perfect for lifestyle use. Available in Gloss white, Gloss Black and Gloss Red colors, the Kunai is ideal for all your movies, music and gaming needs. For the gamer on the go this Holiday, the R.A.T.M makes a stunning addition to their gaming arsenal. The latest member of the famous R.A.T. range, this state-of-the-art gaming mouse is the first to combine the power of Bluetooth® Smart 4.0 technology with a gaming-grade laser sensor and market-leading battery life for optimum performance. The R.A.T.M with GameSmart technology is compatible with PC, Macs, and the next generation of TVs and tablets either directly or via the included Nano Dongle USB receiver. With an adjustable palm rest, 12 action buttons (including 10 programmable) and a power-efficient 6400 DPI twin-eye laser sensor, the R.A.T.M is the ultimate mobile gaming mouse. Based on our Guinness world record-winning R.A.T. gaming mouse, the M.O.U.S.9 reinvents the everyday mouse for the next generation of user. Designed as the perfect companion for uses outside core gaming, the M.O.U.S.9 comes complete with GameSmart technology, allowing for connection to a wide range of devices from PC and Mac, the M.O.J.O. Micro-Console, as well as Tablets and Smart Devices. Featuring our patented adjustable palm rest and a laser sensor that can track on virtually any surface, even glass, the M.O.U.S.9 Wireless Mouse offers dedicated profiles for home and office applications such as Adobe® Creative Suite and Microsoft® Office. A brand new Kunai for the mobile generation, the Kunai Mobile Stereo Headset presents the perfect blend of strikingly cool style, premium audio quality and unbeatable value for money! Available in matte black, matte orange, matte blue, and matte red colors, the Kunai features interchangeable, magnetic speaker tags, with each headset includes two extra sets – for a total of six tags – to provide more options for adding personal style. The TRITTON Kunai Mobile Stereo Headset is compatible with most popular handheld consoles, Windows® PC, and Mac, as well as smart phones and smart devices, including most iPhones. When used with compatible Apple products, the Kunai provides the ability to adjust volume, answer calls, and control music on-the-fly via the convenient in-line audio controller. Smarter than the average headset, the Mad Catz F.R.E.Q.M delivers clear stereo audio for gaming and media on your mobile devices and PC or Mac, and utilizes a host of advanced technology to improve smartphone conversations. Boasting compatibility with Apple products and Bluetooth audio-enabled devices, the F.R.E.Q.M Wireless is an extremely intelligent headset. Wireless by design, the F.R.E.Q.M also provides wired connectivity for situations in which Bluetooth is not allowed or available. The included 3.5mm connector cable provides an optional wired connection – perfect for use with smart devices and during air travel. And, courtesy of the included USB charge cable, the headset gains play-and-charge capability when connected to a PC or Mac. The F.R.E.Q.M features automatic management of audio interaction between two paired devices allowing you to pair two separate Bluetooth devices simultaneously. The F.R.E.Q.M Wireless employs an Apple-approved Bluetooth co-processor to ensure compatibility with Apple products, supporting aptX and AAC Audio Codecs. If your device supports aptX, audio comes through the headset's earcups at CD quality with low latency, ideal for movies and gaming where lip sync is essential. To ensure the highest quality audio on both ends of the line during communication, the F.R.E.Q.M employs CSR's state-of-the-art CVC audio enhancement software, supressing background audio for crystal clear calls. Lastly, the Mad Catz mobile A.P.P. allows users to adjust several aspects of their headset as well as checking battery levels on their Android or iOS device.